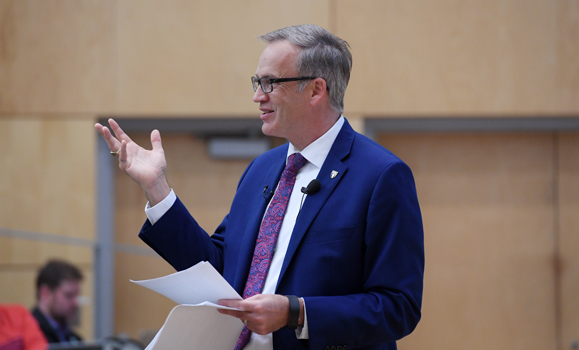 Dal President Richard Florizone’s annual Inspiration & Impact: Our Year in Review town hall is meant to be an opportunity to reflect on the past year at the university and celebrate achievements across the university. But sometimes breaking news takes precedence, which on Thursday morning (June 21) meant two things. The second news to be addressed before getting underway was Monday’s big announcement from Board Chair Lawrence Stordy: that President Florizone will be leaving Dalhousie in the new year to lead the new Quantum Valley Ideas Lab in Waterloo, Ont. Described as “the opportunity of a lifetime,” he’ll be helping establish Canada as a global leader in emerging global field of quantum computing. “It kind of takes me back to my roots as a physicist, and so I’m excited about it,” President Florizone told the crowd gathered in the McCain Building’s Ondaatje Hall, as well as those watching online via livestream. 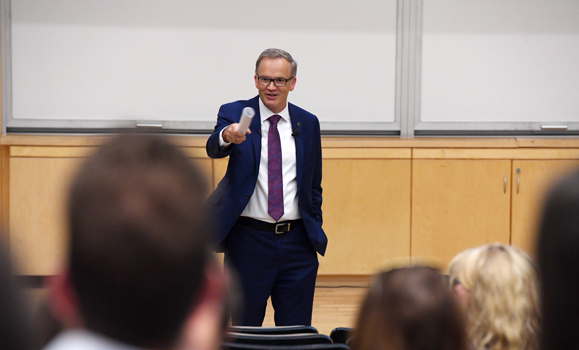 With just over six months left in his presidency, Dr. Florizone plans to continue to help the university community push forward on the core areas of its current Strategic Direction, now in its final year. 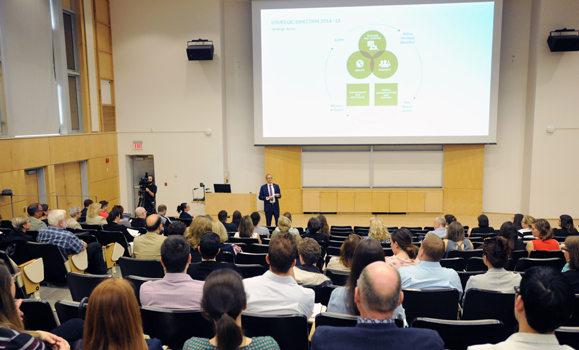 In Thursday’s presentation, he shared insights on the plan’s five pillars — Teaching and Learning, Research, Service, Partnerships and Reputation, and People, Infrastructure and Support — as Dal approaches its third century. “For me, as I reflect on the last five years, we really put in a couple of years ‘tilling the soil,’ if I can go with an agricultural metaphor,” he explained. “We had some challenges as a campus as well. In Teaching and Learning, for example, President Florizone highlighted student award winners from the past year like Rhodes Scholar Nayani Jensen, 3M Student Fellow Martha Paynter and Top 8 Academic All-Canadian Anne Dunn-Suen. He discussed the early success of the On Track program to support student retention, which saw participating students continue in their studies at a rate 23 percentage points higher than those who didn’t participate; and a litany of faculty awards, ranging from Jocelyn Downie’s Order of Canada and Julia Wright’s induction to the Royal Society of Canada, to Drs. Patrick McGrath and Patrician Lingley-Pottie receiving the Governor General’s Award for Innovation — just to name a couple. 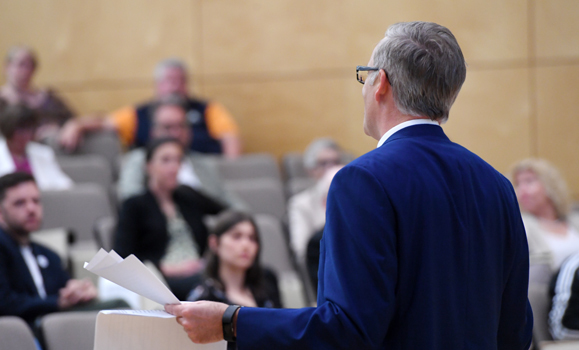 Then there’s Research, in which Dalhousie received a record total of funding last year at $156 million — a testament, President Florizone explained, to the quality of Dal’s faculty researchers. He also highlighted that Dal continues to rank third among Canada’s U15 universities in industry-sponsored research per faculty member. Under Service, President Florizone highlighted community clinics in Dentistry, Social Work and Law, as well and Dal’s success in providing hands-on, real-world learning for students. Last year, 100% of direct-entry undergrads had access to experiential learning opportunities, with 89% taking advantage of them. “We’re giving our students not just a world-class, accredited, high-quality experience in the classroom, but we’re giving them those experiential opportunities as well,” said President Florizone. As is the case in previous years’ presentations, President Florizone highlighted specific stories under each Strategic Direction area with a video. These included the new Aboriginal and Indigenous Law in Context course in the Schulich School of Law; Dr. Katherine O’Brien’s pending arrival as the new Canada 150 Research Chair in vaccinology; and Dal’s role in supporting the new Ocean Supercluster in the region. Other videos highlighted Dal’s 200th anniversary celebrations (for Partnership and Reputation) and the new Dalplex fitness centre (for People, Infrastructure and Support) — one of several exciting new spaces set to open on campus this year, alongside the Sexton Campus IDEA project, the new Ag Campus learning commons and others. Additional items of note from President Florizone’s included record success in Annual Giving fundraising ($4.5M) and that the university is nearing full labour market representation of Indigenous employees. And in the Q&A portion of the event he discussed internationalization, collaboration with the DSU and Advancement around upcoming Homecoming celebrations for Dal 200, and the role of MIT-REAP (Regional Entrepreneurship Acceleration Program) in inspiring of the sector-spanning successes Dal and its partners have seen in recent years like the Ocean Supercluster and others. “I love the sense of momentum on campus,” said President Florizone, concluding his remarks.